Question: Do spray paint and enamel paint get along? Specifically I'm thinking of using one-shot enamel sign paint in a mural and would like to incorporate sray paint as well. Are there issues between mixing these paints in terms of drying/curing times? Also is there a possibility of re-activating base coats by adding additional layers? I'd appreciate any advice on process or recommended brands of spray paint. Thanks! AP Reply: Some spray paints are enamels. And yes there can be issues whether you are using Oneshot over the paint or under it. The best thing you can do is apply a neutral clear coat barrier between the Oneshot and spray. The Krylon Clear Acrylic would be a good choice. It will encapsulate whatever is underneath to minimize a reaction. Just make sure the base layer is dry before doing so, as paint will shrink during curing, causing cracks on the top layer. As for Brands I have used both MTN and Molotow with Oneshot. 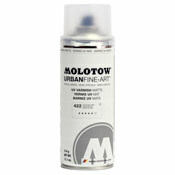 I usually have the best results with Molotow as its a Nitro type. The synthetic enamels in MTN can react at times, but its more negligible when applying the acrylic clear between the layers. Good luck!